Protect people from uneven walkways and mezzanine drop off's. 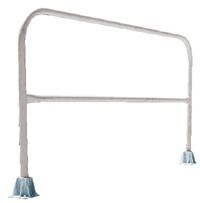 These durable railings are made of schedule 40 pipe (1-5/8" O.D.). Handrails are 42" high with a 21" midrail. 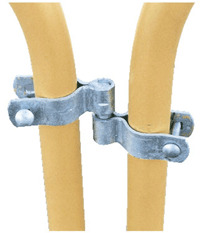 Mounting options include socket sleeves, barricade base or cast steel sockets for convenient handrail removal. 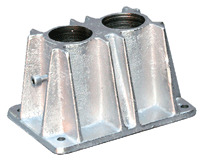 The cast steel sockets accept wood 2" x 4" for 2" x 6" when toe boards are required. Steel Railing features powder coat yellow finish. 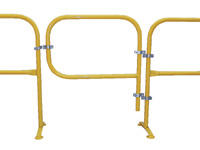 Steel Pipe Safety Railing's (Series V-VDKR) -Ship in 48 Hours!! Model V-VDKR-KIT - Anchor Bolts for Concrete - (4) 3/8" x 3"